The Canada‐Newfoundland and Labrador Offshore Petroleum Board (C‐NLOPB) is amending its Scheduled Land Tenure System (SLTS) in relation to the timing of four active sectors and cumulative parcels. NL02-LS – Previously scheduled to close in November 2019, is now scheduled to close in 2023. NL01-NEN – Previously scheduled to close in November 2020, is now scheduled to close in 2024. NL01-SN – Previously scheduled to close in November 2020, is now scheduled to close in 2022. Since adoption in 2013, a fundamental goal of the SLTS is to operate such that any parcels not awarded in a CFB will be reassessed and reposted in the subsequent CFB for the region in question (if prospective). This reposting will be supplemental to the lands defined by the nomination process for that call, and will allow for a cumulative increase of lands being available in the SLTS over time. The reposting of lands in High Activity and Mature regions has been ongoing since inception of the SLTS with cumulative, unawarded parcels being reconsidered annually in the Jeanne d’Arc (JDA) region and every second year in the Eastern Newfoundland (EN) region. As this year will see the first close of a CFB in a Low Activity region, namely NL01-SEN, the need has arisen to schedule cumulative, unawarded parcels in subsequent Low Activity CFB. The C-NLOPB will offer cumulative, unawarded Low Activity parcels every second year, alternating between the Northern and Southern Areas. The Southern offering will be a combination of previously unawarded parcels from South Eastern Newfoundland, Southern Newfoundland and Western Newfoundland and Labrador, and will begin in 2021. 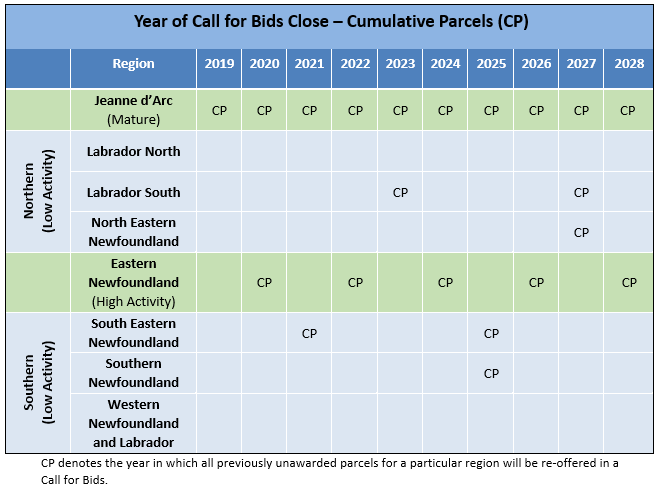 The Northern offering will be a combination of previously unawarded parcels in Labrador North, Labrador South and North Eastern Newfoundland and will begin in 2023. Offshore safety and environmental protection are paramount in all Board decisions. The C-NLOPB supports the protection of environmentally significant and sensitive areas, and will continue to work closely with Fisheries and Oceans Canada and other federal and provincial departments in this regard. The issuance of any CFB requires C-NLOPB Board approval and ratification by the federal and provincial governments. Assessments of regional and/or site-specific issues will be completed before any work can begin within the licence area. The timing, spatial extent, and nature of proposed oil and gas activities, in addition to mitigations already prescribed by legislation, will determine the level of additional restriction or mitigation that may be required. The Board is also discussing with the Government of Canada and the Government of Newfoundland and Labrador, potential new approaches to environmental assessments through a Regional Assessment of offshore exploratory drilling in Eastern Newfoundland. Further detailed information about scheduled land tenure is available here.